The 2017 Dodge Ram 2500 is a heavy-duty pickup truck that’s designed to tow and haul workloads that lesser trucks simply can’t handle. In addition to being able to tow up to 17,980 pounds, the Ram 2500 provides rich interior style and high-tech infotainment features. This heavy-duty truck is also big on safety, helping you transport major weight without a hitch. On the road, the Ram 2500 offers a best-in-class ride, supplying a smooth, comfortable trip. When it comes to power and performance, the 2017 Dodge Ram 2500 can’t be beat. Choose from a range of engine options for the capabilities you require. We’re fond of the 6.7-liter Cummins turbodiesel engine, which generates 370 horsepower and 800 pound-feet of torque for maximum towing performance. This engine is paired with a beefy automatic transmission that’s designed to tackle heavy loads like a pro. You can also choose between two V8 engine options, including a 6.4-liter V8 that produces 410 horses and 429 pound-feet of torque. 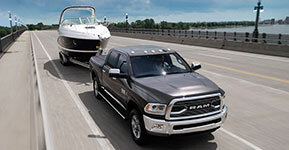 Properly equipped, the Ram 2500 tows up to 17,980 pounds. Use your Ram 2500 to haul max loads of 3,999 pounds. On the road, the Dodge Ram 2500 offers a smooth, composed performance. Even at high speeds, the cabin remains peaceful and quiet. High-tech features, like hill descent control, lend themselves to a ride. With four-wheel drive, you’ll enjoy maximum traction over rugged terrain. Advanced performance gear, like the electronically disconnecting sway bar and locking differentials, give you absolute precision in off-road territory. When it comes to safety, the Ram 2500 has your back. Six airbags maximize passenger protection during a collision. The Ram’s four-wheel antilock disc brakes provide strong stopping power in a pinch. Electronic stability control increases driver authority when road conditions are less than ideal. The rearview camera helps you spot ay obstacles in your path. The Ram’s security alarm serves as a deterrent for would-be thieves. Inside, the 2017 Dodge Ram 2500 supplies ample passenger space and luxurious comfort features. Posh leather seats and handsome accents make you feel like you’re cruising in a luxury SUV. Choose from a variety of cabin styles – regular, extended, and crew – for the passenger space you require. No matter which option you prefer, you’ll find plenty of head- and legroom throughout the cabin. 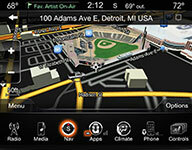 High-tech infotainment gear adds to your on-road experience. The central Uconnect system offers up-to-the-minute weather and traffic data. Its smartphone integration features make it easy to make hands-free calls or stream your favorite audio options. The Dodge Ram 2500 Limited delivers the utmost in utility and interior comfort. 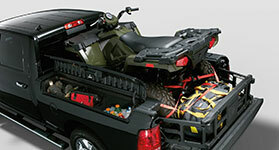 It comes with the unique RamBox cargo system, a lockable exterior bin that lets you organize work tools and the like. The bed’s LED lighting system makes loading a snap, even after dark. Inside, the Limited treats you to handsome black leather upholstery. Hit your favorite off-road trail without a care in the world. It’s never been easier to stow, organize, and safely lock up your supplies. The 2017 Ram 2500 tackles heavy loads with ease. The central infotainment system keeps you connected, no matter where you travel. The 2017 Dodge Ram 2500 is the perfect choice for drivers who crave rich passenger comfort and world-class towing and hauling capabilities. On the road, the Ram 2500 feels composed and confident. Advanced safety features help you get wherever you need to go without a hitch. Inside, the Ram 2500 offers upscale comfort and long-term support. High-tech features, like the Uconnect infotainment system, provide crystal-clear audio and excellent smartphone integration options. Feel the power of the Ram 2500 on a test drive today!